Don't call it 1999 JU3 anymore. It's official, the asteroid targeted by Hayabusa 2 mission is now named Ryugu. While waiting for the official publication in the "Minor Planet Circular", this name is already ont the list of names of the small bodies of the International Astronomical Union (IAU). In japanese legends, Ryuguis the name of the submarine palace of Ry?jin , the god-dragon of the sea. This legend is very well known in Japan. 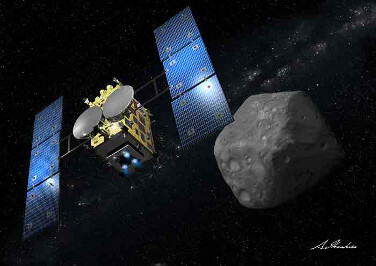 Hayabusa 2 mission objective is to realize a rendez-vous with a NEO asteroid of the C kind, C for carbonated, witness to the origin of the Solar System, in order to realize several experiments from a distance and to collect samples. The probe was launched on December 3rd, 2014, it should reach Ryugu in 2018. It will observe this NEO of 900 meters diameter before droping a small German-French lander, MASCOT, on its surface. then samples will ba taken, with a return on Earth in 2020. Since its launch on December 3rd, 2014, Hayabusa 2 turned one time around the Sun in a trajectory similar the the Earth's . On next December 3rd, one year on the day after leaving the Earth, the probe will make a "swing-by" of our planet, in order to gain sufficiant speed to reach the asteroid in a direct trajectory. In 2016 and 2017 good health tests of MASCOT lander (2 per year) are scheduled but not yet planned, to prepare the arrival near the asteroid programmed in 2018.